A while ago a friend of mine asked if I could make wedding cake for her wedding. I've never done it but I was really eager to make one. I am a buttercream person so I don't make fondant cakes. 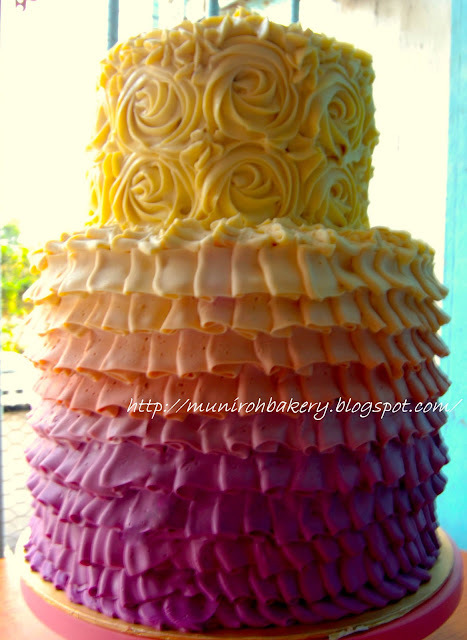 Fondant is pretty, and I am amazed with beautifully crafted fondant cakes, but I don't like the taste of fondant. Besides, it takes a lot of time to make a really pretty and neat fondant cake, which is not suitable for a night-time baker like me. My friend was okay with the cream cheese frosting, and I told her the design that I could make for her. We discussed over several things; the height, design, price range, color etc. I didn't sketch the design, because I always imagined it in my head (aside from the fact my drawing talent has been declining after I graduated from high school), but my friend was okay with my idea. I have very small oven thus I have to wait long hours baking the cakes. Because of that, it took me 11 hours to finish making her cake. I was happy with the product though, and she was too after receiving the MMS of her wedding cake.